Ralph Abernathy at National Press Club luncheon. Photograph by Warren K. Leffler, 1968 June 14. 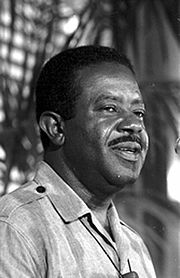 Ralph David Abernathy (March 11, 1926 – April 17, 1990) was an American civil rights leader. Newly married and having recently accepted the call to pastor a Baptist church in Montgomery, Alabama, Ralph and his wife Juanita met and became friends with another young Baptist minister and his wife, Martin Luther and Coretta Scott King. The two couples shared many evenings over dinner together, discussing ideas, sharing inspiration and friendship. Ultimately, plans were laid for the nonviolent civil rights movement began by the two men and led by Martin Luther King. Ralph Abernathy and Martin Luther King were best of friends, partners, and colleagues. They initiated the most famous Montgomery bus boycott following the arrest of Rosa Parks, and many marches and protests against the "Jim Crow" segregation laws in the south and discriminatory practices through out the United States. They shared many a jail cell following arrests for their peaceful protests. Abernathy was only a few paces behind King when King's life was cut short by an assassin's bullet in Memphis, Tennessee. Abernathy went on to lead the Southern Christian Leadership Conference that the two had founded together, following King's death. Ralph David Abernathy was the tenth child of William and Louivery Abernathy, a well respected family of Linden, Alabama. His baptismal name was David, after the biblical figure who conquered Goliath. William and Louivery hoped he would embody the same faith and courage of the biblical David. His maternal grandmother, a midwife who aided in his delivery, sensed he had special potential. Most of the people in Linden, Alabama, made their living as farmers. The Abernathy's were no exception. William was a stern and hardworking man who believed the way to improve the lot of African-Americans was prosperity gained through hard work. Through practicing this belief, he slowly invested in land until he owned five hundred acres, one of the largest farms in the area. Due to W.L. 's hard work and frugality, the family was better off than most white families in Linden. In addition, William served on the school board for the black high school in the community, as deacon of the Hopewell Baptist Church, and was the first black man to serve on a grand jury in the county. As stern as his father was, David's mother was kind and loving. She was quiet, gentle, and devoted to God and her family. Through her example of motherly love, Louivery taught her children about love and responsibility. When the Great Depression hit, the Abernathy family was largely insulated from its effects because the farm produced a bounty of all manner of food. Cash crops like cotton could be sold or traded to meet other needs. The Abernathy family were comfortable but very thrifty. Young David wore hand me down clothes and played with second hand toys. When he started school, he was given the used books of his older brother William. David longed for new books of his very own. His mother saw his anguish about this and just this once, she intervened and stood up to her husband on David's behalf. New books were purchased for the young student. He knew it was his mother's love and understanding of his need that made this happen. David's family was very religious, regularly attending church and Sunday school. David absorbed knowledge of Bible stories and the life of Jesus Christ. At a young age, he began to dream of becoming a pastor. When he was only seven years old, he longed for a personal experience with God. His mother told him to spend a day fasting and praying so that he would hear God's voice and have God "grab his soul." One day David skipped breakfast and spent the day outside praying. Mid-afternoon young Abernathy had the experience he was waiting for. "I only know that a sudden peace flooded my soul, and in an instant I was a different human being," he told in his autobiography. Once touched by God, the young boy headed into the kitchen for a meal of biscuits. Farm life meant hard work for the whole family. David was assigned to help his mother in the house while the rest of the family tended the fields. He rose early to start the fire in the woodburning stove, milk cows, gather eggs, feed livestock, do errands for his mother, and help with meals. He also watched his younger siblings, Susie and James Earl. When he had a free moment, he read or wrote or played ball with his sisters and brothers in the fields. This was a big happy family that enjoyed mealtimes together. It was when David was twelve that his sister began calling him Ralph David after a teacher she respected. The name held and the rest of the world came to know him as Ralph David. In addition to the immediate family, many relatives lived nearby. Ralph knew he needed to behave himself when he was out and about because it was likely he would run into someone he knew. He was especially close to his paternal grandfather, George Abernathy, who told stories about his slave years, focusing on the pleasant memories rather than dwelling on bitterness. Ralph had little contact with whites growing up, so little experience with racism, but his father had warned the children that playing with white children could lead to trouble. He only experienced one dangerous encounter with a hateful white man, but was saved by a storekeeper who knew his father, and spoke up on his behalf. When Ralph David was just a teenager, his father suffered a fatal stroke. Ralph's grandfather, George, never got over his grief, and passed on several years later. As World War II began, Ralph's three older brothers left home to serve. In April 1944, Ralph received orders to report to Fort Benning, Georgia, for his army physical. He was barely 18 years old. He was called to active duty and was sent with other recruits to Fort Devens, Massachusetts, for basic training. Abernathy was dedicated to doing his best and worked hard. He was promoted to platoon sergeant and soon afterwards, boarded a ship bound for France with his platoon. Although the war in Europe was all but over by the time they arrived, they traveled through the continent for "mop up" duty. Ralph saw first hand the devastation that war had brought to the cities and the suffering upon the people of both sides. This experience was pivotal in his decision to commit to a life of nonviolence. One rainy night Sergeant Abernathy was supervising the punishment of two of his soldiers, who had been ordered to dig a deep hole. He got thoroughly soaked and chilled and fell ill with rheumatic fever. When the rest of his unit was shipped to the South Pacific, he was not well enough to join them and was sent home. Many years later, he learned that he and one other soldier in his unit were the only ones to survive the war. After serving in the army during World War II, he enrolled at Alabama State University, in Montgomery, Alabama, graduating with a degree in mathematics in 1950. Not far into his college work, Ralph's mother's health began to decline due to rheumatoid arthritis. Ralph was home for Thanksgiving in 1947, to see her for the last time. She died two days later. Ralph was overcome by the fond memories of his youth and the grief of losing his mother. Even though he was one of the youngest, his siblings turned to him as the head of the family. His involvement in political activism began in college while he was a member of student government and Kappa Alpha Psi Fraternity. He led demonstrations protesting the lack of heat and hot water in his dormitory and the dreadful food served in the cafeteria. In addition, a civics professor explained the power that voting would have for black people. Abernathy grew so inspired by the idea that he convinced a group of students to go to the Montgomery courthouse and register to vote. His colleagues failed to fill in all the blanks on the long complicated literacy test form and were refused. But Abernathy filled in every blank on the form and was rewarded with a voter registration card. Ralph became more and more devoted to God and his church. On Mother's Day 1948, he stood up at Hopewell Baptist Church and announced his call to the ministry of Jesus Christ. It was during these college years that Ralph met and began to spend time with Juanita Odessa Jones, a woman whose quick wit and strong character, he admired a great deal. She would eventually become his wife (even though she was determined not to become a preacher's wife). In 1951, he earned an M.A. in sociology from Atlanta University (later Clark Atlanta University). During the year spent in Atlanta, Ralph was given the opportunity to be a guest preacher in many churches in the area. One Sunday, he attended service at Ebenezer Baptist Church to hear another guest preacher, also a student, by the name of Martin Luther King, Jr. He knew immediately that King was an outstanding man. Following graduation, Abernathy took a job as dean of men at Alabama State University. He also took a part-time pastorship of Eastern Star Baptist Church in Demopolis, Alabama, near his hometown of Linden. Just one year later, when he was only twenty six, the people of the 100 year old First Baptist Church of Montgomery asked him to be their pastor. He accepted the role. Once settled into the community at First Baptist Church, Abernathy was ready to share his home and life with a wife. On August 13, 1952, he and Juanita became husband and wife. In the several years that followed, they became parents. The first child, Ralph II, died as an infant. Three more children, Juandalynn, Donzaleigh, and Ralph III brought joy and comfort to the family. The Abernathys enjoyed opening their home and table for guests. One night the young preacher, Martin Luther King Jr. found his way to their dinner table while being considered for the pastorship of the Dexter Avenue Baptist Church. King was offered the position. Soon Martin and Coretta were regular dinner partners with Juanita and Ralph. The women took turns cooking dinner. A close and enduring friendship and partnership formed between Ralph Abernathy and Dr. Martin Luther King, Jr.. In 1955, when Rosa Parks refused to move to the back of the bus, Abernathy and King organized the bus boycott in Montgomery. After a year, the boycott finally ended when the United States Supreme Court affirmed the U.S. District Court's ruling that segregation on buses was unconstitutional. Soon after the boycott ended, Abernathy and King met with other African American pastors and formed the Southern Christian Leadership Conference to organize peaceful marches and protests for achievement of civil rights for blacks in all spheres of life in the South. King was appointed president and Abernathy became the Secretary-Treasurer. The main purpose of the organization was to bring an end to segregation and to bring about the creation of civil rights legislation. In 1957, Martin Luther King was called to pastor Ebenezer Baptist Church in Atlanta. He wanted his good friend Ralph to join him in Atlanta, but it took some coaxing, as the Abernathy family had put down roots in Montgomery. Eventually, though, Martin had his way, as Rev. Abernathy received the call from West Hunter Street Baptist Church, the family made the move. This was the church that Abernathy was to serve as pastor for the rest of his ministering career. In the spring of 1963, King and Abernathy and the SCLC leadership orchestrated a massive effort to desegregate Birmingham, Alabama. National media focused attention on the rough treatment of African American protesters by Eugene Connor, Birmingham's director of public safety. King and Abernathy were arrested and jailed along with 3,000 others who were protesting segregated conditions in the city. These demonstrations drew attention to the issue to such a degree that 250 cities of the south initiated desegregation efforts, opening thousands of schools and other public and private facilities to people of all races for the first time. The success of this effort also helped embolden President John F. Kennedy to send a civil rights bill to the U.S. Congress. Civil Rights leaders demonstrated their support of this bill by organizing a massive march on Washington D.C. held on August 28, 1963. Over 250,000 people joined the march. This was the moment when Martin Luther King gave his famous "I have a dream" speech. Abernathy was behind his friend during the speech and was deeply inspired by what he said. Abernathy insisted that the Holy Spirit had guided King's words that day. The following summer, the Civil Rights Act (1964) was passed. In 1965, the Voting Rights Act was passed. Since the very beginning of the civil rights movement, Rev. Ralph Abernathy and Dr. Martin Luther King, Jr. had been side by side, planning together and implementing their plans as partners with the greater community. As the strike by Memphis sanitation workers began on April 3, 1968, the two leaders were close together. As they walked, Abernathy was just a few paces away from King. It was no different on April 4. In fact, the two were sharing Room 307 at the Lorraine Motel in Memphis, Tennessee. As they prepared to go for dinner at a local minister's home, Dr. King strolled out on the balcony of their room. Only moments later, Rev. Abernathy heard a loud crack and soon realized that his longtime friend and colleague had been shot. This was a moment when everything changed. Though Abernathy rode in the ambulance with King, stayed in the operating room with him as doctors labored to save him, it was not to be. Abernathy held his friend in his arms as he passed on. Abernathy assumed the presidency of the SCLC after King's death. Less than a week after the assassination, Abernathy continued the march to support striking sanitation workers in Memphis. In May 1968, he, among others including Jesse Jackson, organized the Poor People's Campaign (PPC) March on Washington, D.C. Hoping to bring attention to the plight of the nation's impoverished, he constructed huts in the nation's capital, precipitating a showdown with the police. The settlement was named "Resurrection City." Abernathy slept in a hotel during the campaign. On June 19, he held a speech at the Lincoln Memorial, in front of tens of thousands of black and white citizens. Eventually on June 24, 1968, the federal government forced the protesters to disband. Abernathy was jailed for nearly three weeks for unlawful assembly. After the Poor People's Campaign, Abernathy continued to lead the SCLC, but the organization never regained the momentum it had when Dr. King was at the helm and the two had acted as partners. Abernathy resigned in 1977, to run unsuccessfully for a Georgia congressional seat. This was a time when Rev. Abernathy had more time to devote to his family. A fourth child, Kwame had been born in 1971. Ralph had time to dote on Kwame, making him breakfast and taking him to school. He had not had the time or freedom to do this for his older children when they were young. But he now had time to help them develop their talents and offer them support and encouragement. In 1980, Abernathy was the most prominent African American to endorse Ronald Reagan, along with Hosea Williams and Charles Evers. Abernathy later said he was very disappointed with the Reagan administration's civil rights policies, and he did not endorse him for reelection in 1984. In the 1980s Abernathy co-founded the American Freedom Coalition, with Robert Grant. The AFC received major funding from Sun Myung Moon's Unification Church and works in partnership with The Washington Times, CAUSA, the American Constitution Committee, and other Unification Church related organizations. Abernathy served as Vice President of American Freedom Coalition until his death on April 17, 1990. Upon hearing of Abernathy's passing, Andrew Young stated that Abernathy had performed "a silent labor that was very much needed. Abernathy was a jovial, profound, loving preacher who gave his life in the service of others." Abernathy received many awards, most notably honorary degrees from Long Island University in New York; Morehouse College in Atlanta, Georgia; Kalamazoo College in Michigan, and his alma mater, Alabama State University. Interstate 20 and Abernathy Road, in Atlanta, are named in his honor. His legacy is represented by the continuing work of the Southern Christian Leadership Conference and of all who struggle to translate Civil Rights legislation into actual reality, since equality in law does not guarantee equality of opportunity in practice or remove the racial bias and prejudice that still exists in the hearts of many. All links retrieved November 10, 2013. Ralph Abernathy New Georgia Encyclopedia. Ralph David Abernathy Encyclopedia of Alabama. This page was last modified on 27 November 2013, at 16:18.